Hi, welcome to fishing with Beavis! This page is for all yall fisherman out there, Beavis will provide you with fishing hints and facts. So let's get ready to learn! 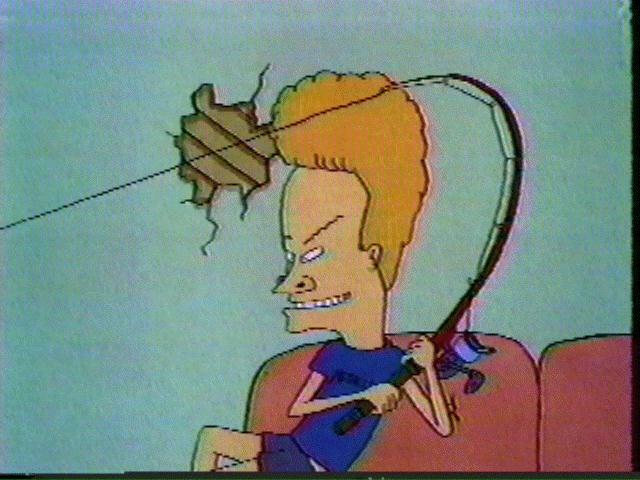 Umm, I mean fishing rod Beavis. Like pliers and stuff, not the band Tool. BEAVIS, I didn't say master-bait. One thing more, get someone like Butthead to carry all your stuff for you. OK, now that you what you need to get started ets go. Click here for more adventures with Beavis!